​​IEMT is a relatively new and exciting area of therapy, yet draws from a background starting in the 1970s, when the original founders of NLP started studying therapists (including Milton Erikson, Gregory Bateson and Virginia Satir) who were achieving exceptional results with the clients they worked with. ​In IEMT the eye movements trigger different parts of the brain to be activated, changing the way the brain recalls and experiences the memory and therefore the attached feelings. 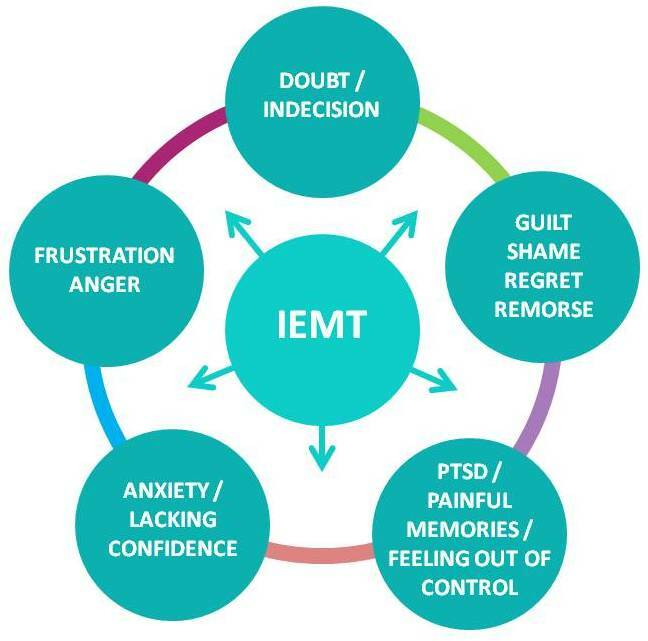 IEMT is a process that allows the mind to access new thoughts and feelings connected with past events / episodes. IEMT creates a shift in the way we experience these memories, creating new 'imprints' that can reduce or remove negative effects associated with the original memory; at the same time it's likely that you will gain new and more empowering insights that allow you to move more positively forward. Dealing with negative past events, or limiting emotions without having to 're-live the experience' or even talk about any of the detail of the event - particularly when the issue is too painful or unhelpful to access. ​Gaining insights in order to move forward / make a change. Being and feeling accountable, rather than acting as if a victim; taking control of your own life, emotions and actions. ​Removing blame or reducing anger. Dealing with symptoms and causes of depression. Achieving increased internal balance and integration; resolving inner conflict. ​Integral Eye Movement Therapy was developed by Andrew T Austin from an original idea from Steve and Connirae Andreas. (Steve and Connirae Andreas have been involved since the 1970s in the developing field of NLP and are authors of a number of books, including 'Core Transformation' and 'Heart of the Mind'). Example: Every time Person 'A' connected with a particular unhelpful memory, it was as if they were re-living it again. The intensity was so great, that it felt like they were experiencing it all again, looking out through their own eyes, getting all the emotion and symptoms. ​They could still get some useful information from the experience, but were no longer affected or restricted by it. It was as if the memory had been put back where it should have been - in the past, instead of re-occurring, on an endless loop, in the present. Example: ​Person 'B' often had the feeling as if they were a victim - at the mercy of others and the situations that developed around them. They felt uncomfortable in certain situations, uncertain of themselves and out of balance. After the first session, the feeling of being a victim was significantly reduced and they started to feel more in control. And after session 2, they were feeling a greater sense of well being and balance. The perceived issues were no longer a problem and instead they had a feeling of calmness and possibility. ​Example: Person 'C' felt like life was passing her by. She seemed to have lost direction and hope. ​During the first IEMT session, the eye movement triggered a realisation of earlier memories, as a child, that she had forgotten about. By working on these memories, using IEMT, she felt that these feelings had cleared away - so much so, she wondered how she could have lived with something so long, and then it no longer be there. In the next few sessions she began to access her old energy and purpose. ​The follow-up coaching session helped her to build an action plan and the book Martin recommended, gave her some strategies that she could work on over time to keep her focus and strength as she worked towards her goals. When we meet you will have an opportunity to add any further information you feel is relevant. However it's not necessary for you to talk a lot about past events, because the Integral Eye Movement Therapy allows you to work on feelings and thoughts, and make change, at an unconscious level. By unconscious, I mean you don't have to over-analyse it; instead we allow the mind to do the work for us - accessing different aspects of your brain (and the way you encode and recall memories) to create change. ​During the session we may repeat the Eye Patterning a number of times, working on different associated feelings and memories - like peeling the layers back of an onion, to get to the core of the issue. ​The IEMT approach can be supported by coaching and NLP, during the session, where that is useful. ​Depending on the depth of the issue / issues, follow-up appointments will be arranged. “Thank you for all your help, support and guidance, I have learned so much. Your coaching technique is excellent and has really helped me to develop my skills." Enabling you to achieve greater confidence, performance, skills and balance in what you do and how you do it; achieving greater success.